"Would you believe it: On my first holiday in Sicily I almost bumped into the Mafia: four strong young men jumped around a large Alfa - and there was a Mafia boss sitting inside it." When asked how these holiday-makers in Sicily knew that these gentleman were Mafiosi, the answer came: "Well, because it was like in the movies!" Apparently they had enjoyed The Godfather trilogy a little too much. Let's get straight to the point: your chances of encountering the Mafia in action in Sicily, let alone seeing a real live mob boss, are zero. First of all, the really powerful bosses usually live in hiding (these are called latitanti in Italian) because they are the lifelong subjects of manhunts by the police. Secondly, most mafiosi work quietly and unobtrusively without being noticed: on the rare occasions when they murder each other, they do it in private! And finally, the police and the legal system in Sicily come down on the Mafia with a sledgehammer, more firmly and decisively than any other country. Most importantly of all, the Mafia are not remotely interested in stealing cameras or credit cards from foreign tourists! All of this means that Sicily today is one of the safest holiday destinations in the world. So, if it was not the Mafia our friends saw in a flashy car on their holidays in Sicily, who was it? It would have been the bodyguards of a politician or even an anti-Mafia judge. You can spot scenes like this near the Town Hall and the Palace of Justice in Palermo, and sometimes outside the buildings of the Sicilian Regional Parliament as well. The leaders of the new, uncompromising movement against the Mafia hold crucial positions in these institutions. Below, we answer some typical questions that holiday makers in Sicily have concerning the Mafia, starting with the most important one: the beginning of the end of the Mafia. Why is the Mafia bad? It seemed like a perfect, sunny weekend for the people of Sicily, and for Judge Giovanni Falcone. Giovanni Falcone and his colleagues had succeeded, during the 1980s, in exposing the reality and the internal structures of the Sicilian Mafia. He had reduced the Mafia to their knees. He was feeling tense, yet optimistic. 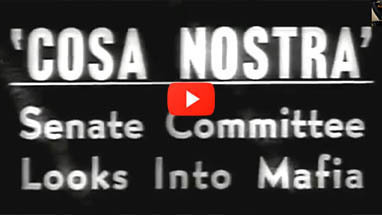 Until he brought about this revolution, the Mafia had managed their own propaganda campaign so effectively that many people – in Italy and the rest of the world - believed the Mafia did not really exist, that it was just an urban legend. They said it was invented by film makers just to harm Sicily's reputation. Meanwhile, in Sicily itself, the people were brainwashed into believing that the Mafia were Robin Hood-style thieves who actually helped the weaker members of society. The Sicilian people were obliged, out of fear, to kiss their local Mafia boss's ring after church each Sunday in a sick parody of the ritual of kissing the Pope's ring. Everyone knew that refusal would be a form of suicide. Judge Falcone brought this age of fear and denial – which allowed the Sicilian Mafia to operate almost with impunuity - to an end. The group led by Giovanni Falcone succeeded, in 1986, in bringing over 400 of them to justice at the same time. In this first "maxi-trial" they were tried together and almost all sentenced to long prison terms. But that was only the beginning. Things started happening fast. The legal system allowed lenient sentences to members of the Mafia who turned pentiti or police informants, and gave information which would lead to the arrest and imprisonment of large numbers of other Mafia members. This led to a watershed in which even greater numbers of mafiosi were brought to justice. The Mafia made one final stand in its losing battle on 23rd May 1992. They placed enough explosives under the motorway in Palermo to blow up Giovanni Falcone's armoured car, his wife and his armed guard and to leave a colossal crater in the road. The picture above shows the memorial to Giovanni Falcone, where this happened. 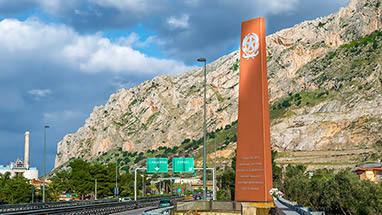 It is the first thing visitors to Sicily see when they drive towards Palermo from the Falcone-Borsellino Airport. This gesture by the Mafia turned out to be the biggest strategic mistake they ever made. The 19th July was a typical Sunday for Judge Paolo Borsellino. As always, he went to visit his mother in Via d'Amelio in Palermo, enjoying a small break from his gruelling work. Paolo Borsellino was a childhood friend and colleague of Giovanni Falcone. In the two months since Falcone was murdered, he had been resolutely continuing the work of preparing evidence for the maxi-trials against the Mafia, though sadly missing his friend and colleague. His family felt he had a death sentence hanging over him, and the stress had devastating effects on them all. "If I give up now, they have won," he told his family. On the road to his mother's house, the Mafia set a car bomb for Judge Borsellino and killed him and his armed guard. The video shows the kind of images we are used to seeing from the war zones of the Middle East. The remaining leader of the anti-Mafia judges said, at the site of the assassination, that it looked as if the Mafia had triumphed. This statement incensed a great many people, and in fact the opposite very rapidly turned out to be the case. The commentator in the film makes the point: "This outrage was the last straw". The assassination led to huge public demonstrations against the Mafia, and against the hypocritical elite who shed crocodile tears at Borsellino's funeral while co-operating with the Mafia behind the scenes. Many politicians had passed laws intended to stop Falcone bringing about any convictions, and they had almost succeeded. Now it was their time to fall. The queue of judges, ready to risk their lives in taking Falcone's place and continuing the battle he began, never stopped growing. Any last member of the population who still thought the Mafia might be secret Robin Hoods sticking up for the powerless man saw them for who they really were. The citizens who had bowed their heads in fear stood up to them in anger and realised they were no more than common criminals. The Mafia in Sicily would never recover from this death blow. The developments brought about by Borsellino's murder are explained in the next section. In 2004, a couple of young people decided to open a bar. They thought about where to find premises, what kind of bar they would like to create, and then of course came the inevitable question. This is the question on the lips of anyone who ever considers starting a business in Sicily. "What will we do if the Mafia come to ask for pizzo?" Pizzo is the extortion money that the Mafia demand from businesses. They tell the owners that they will bomb their business premises, or kill their families, if they do not pay. Some areas of Sicily are free of this extortion whilst others are plagued by it. Business owners in this position either pay, and keep it secret because it is a crime to give money to the Mafia, or they report it to the police and risk being murdered if the Mafia find out. The extortionists cannot be arrested until there is concrete proof against them, and this can be difficult to obtain. "People who pay protection money are people without dignity"
The media coverage was phenomenal the civil resistance against the Mafia became very strong. The young entrepreneurs who had thought of this scheme founded the anti-protection-money initiative called "Addiopizzo". 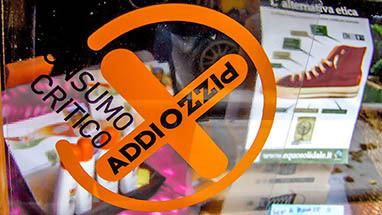 The picture above shows an Addiopizzo sticker in the window of a shop. When you spend your money in these shops, you can be fairly sure your holiday spending money will not end up in the pockets of the Mafia. 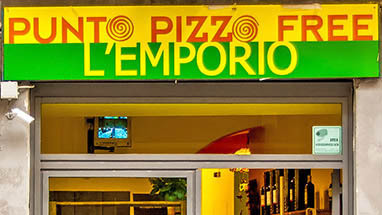 In 2008, Fabio Messina opened a shop called "Emporio Pizzo Free". He was a veteran activist in the Addiopizzo movement, so it was no surprise his business was one of 800-plus belonging to Addiopizzo, the association whose members refuse to give money to Mafia extortionists. Fabio Messina's Emporio Pizzo Free goes one step further: he only buys his goods from producers who are, in turn, members of Addiopizzo. A good example of such products are the wines from "Libera Terra", an organization that cultivates wine and other agricultural products on land confiscated from the Mafia. In this way they make sure that the entire supply chain from producer to consumer is Mafia-free. "Italian investigators seize Mafia assets worth 1.3 billion euros"
So ran the headlines in many newpapers announcing a major coup against the Mafia. This confiscation of assets was major news, even for those accustomed to reading about successes against the Sicilian Mafia. The property was confiscated from Don Vito Nicastri, a boss from Trapani known as the "King of Wind Energy". He was a truly modern Mafioso. Today, they do a great deal of their business defrauding the Italian Government and the European Union of subsidies. Those intended to create a "green future" are particularly lucrative. Don Vito had acquired his millions taking subsidies to build electric wind turbines, some of which would never be used and most of which never existed. Similarly, it turned out a few years ago that Sicily's best-known organic wine-farmer was also a Mafioso. The kings of the wine and the wind now are behind fairly thick bars. Their confiscated land was handed over to the initiative mentioned above, Libera Terra. The organic wines produced on the former Mafia lands are now not only chemical-free, but also Mafia-free! These days, a list of confiscated assets forms a standard part of news reports on the arrest of Mafia members in Sicily. By law, anyone accused of Mafia-related crimes has his assets siezed at the moment of arrest, to ensure he cannot transfer them to other people's names or make them "vanish" in other ways. They are only returned if the person arrested is proven innocent at trial. 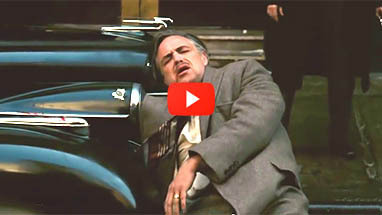 The video on the right shows an excerpt from the film Corleone. It tells the story of two childhood friends. One became a peasant leader. The other became a Mafia boss in Corleone, after he had murdered his former childhood friend. The "man of honor" (he enters in his carriage). The dispute portrayed in the film revolves around the use of farm land. It was in Sicily's beautiful and rugged countryside that the Mafia had its origins. As in most other parts of Europe, Sicily historically had a feudal system, under which land was the property of a few aristocrats, and farm work was performed by landless peasants. The Feudal system dominated most of Europe for 1,000 years, but it lasted longer in Sicily than it did in most other countries. In the film, the farm labourers gathered each day in a main square of Corleone, hoping to get work for the day. The land-owning barons lived far away in Palermo or other cities, and had estate managers called "Gabellotti" ("gabella" means customs or lease) who hired workers. These Gabellotti had armed helpers called "Campieri" (field guards). Management specialists from northern Italy, sent to Sicily in the 1860s, reported strange organizations. They covertly ruled entire villages and called themselves "Mafia". Their bosses were the Gabellotti (the gentleman in the coach in this film clip) and their foot soldiers were the Campieri (the men with shotguns and flat caps). The historically interested reader now may wonder why these agrarian "Mafias" emerged only in Sicily. The fact is, southern Italy has other organisations which play exactly the same role as the Mafia (The Camorra and the Ndrangheta). Historians will probably never be able to clarify the genuine origins of the Mafia with any certainty. After all, the Mafia is a secret organization. The reasons why the Mafia came to dominate Sicily relatively easily can be explained, though. Firstly, Sicily had for centuries had a culture of corruption, bribery and "recommending" friends and relatives for jobs rather than recruiting people on merit. The complacent aristocracy had become disinterested in managing their own land. They prefered to celebrate lavish parties in their palaces in Palermo, as shown in the famous novel and film "The Leopard". Meanwhile, the gabellotti ran the farms, but under challenging conditions. Their leases were only valid for a few years, which meant they were forced to aim for short-term profit maximization rather than long-term agricultural investment. The frustration of the landless, poverty-stricken peasants repeatedly led to violent uprisings. Most families lived on the verge of starvation. The gabellotti had to suppress these uprisings if they hoped to earn any money themselves, and thus the estate managers became commanders of local militia forces as well. The film shows how the aristocracy perished as a result of their own laziness and complacency. It also gives a clear portrayal of the basis of Mafia rule: violence. What the film does not show, of course, is how the Mafia has declined since ist early days. EU crime statistics show, however, that the probability of being murdered in Finland is twice as high as in Sicily. Who could have imagined that 30 years ago? At first sight this sounds like a very stupid question. Who wants blood and murder? If you scratch beneath the surface, though, it becomes clear that the Mafia perpetrates a lot more than this. It affects the lives of ordinary Sicilians every day. The wider activities of the Mafia are actually portrayed in movies like "The Godfather" or "Corleone". Yet most people who watch these films do not have the background knowledge to recognize these subtleties. What is easily recognizable in these films, and most memorable? That's right – blood and murder! 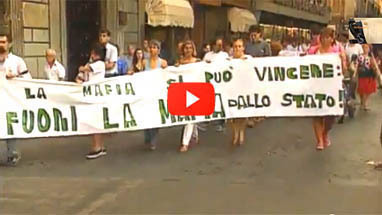 The other obvious activities of the Mafia, such as the trafficking of people, weapons and drugs, are explained in the video on the right in detail. The interviews with some fallen Mafia bosses are particularly interesting. Below, we explain three examples of other ways in which the Mafia damages Sicilian society and the Sicilian economy. At first sight these seem far less dramatic. In reality they do more damage, to more people, than the cinematic activities of drug trafficking and murder. The Mafia in Sicily is ..
For a good pizza you need a yeasty dough, tomato sauce, cheese and a topping to your taste. Imagine you are the owner of a pizza restaurant. You need to source the best quality ingredients at the lowest prices. To do this, you need a choice of competing suppliers. If there is only one supplier, they can charge you high prices and give you low quality. Since monopolies are the natural enemy of any free market economy, and make it impossible for consumers to get quality and value for money, they are illegal in most countries. They are fought by the EU Commissioner for Competition, the U.S. Federal Trade Commission and other organisations around the world. A monopoly on pizza ingredients was exposed in the USA in the 1970s. Who was behind it? Of course, the U.S. branch of the Sicilian Mafia! The pizza-topping Mafia monopoly may sound like a joke, but in reality it was a far-reaching organisation with devastating consequences for honest suppliers, and for consumers who often ended up eating rotten meat as pizza topping. In the eighties, the Sicilian Mafia used violence to take over the entire citrus fruit industry and thus ruined the business. They still monopolise trade in other fruits too. In doing this they put honest farmers and companies out of business and they cheat consumers out of the prices and quality they deserve. Do you remember the young people we described initiating the Addiopizzo movement? They wanted to open a bar, but feared the Mafia would extort their business earnings. Now imagine that they had actually opened a successful bar. The more successful it was, the more likely they were to be asked for "pizzo", or extortion money. You might think this situation would be unpleasant, yet tolerable if the business was making plenty of profits. In the past, many people in Sicily used to think this way, and they played down the problem of extortion. The Mafia would not kill the cow they wanted to milk, people believed. Yet the steady stream of businessmen who cannot make ends meet and go out of business, or who commit suicide because they cannot pay the Mafia and fear for the lives of their families, prove this is not the case. Even when companies do not go out of business, pizzo can destroy enterprise. The owners of the long-established restaurant in Palermo called the Antica Focacceria San Francesco can tell you a thing or two about pizzo. Their extortion story started with a seemingly harmless request for a free cake and ended with the total infiltration of the business. By the end of it, the owners were not permitted to choose who to employ, from whom to buy their supplies or which craftsmen they recruited. Under these circumstances, would you be motivated to develop new business ideas, let alone to implement them? For example, to renovate you store? Or to expand your product range? Or to open a branch office? Probably not. By 2007, the owners of the Antica Focacceria San Francesco reached the point where they had to choose between completely abandoning the restaurant, or shaking off the Mafia. They chose to fight the Mafia. Their brave decision made prisoners of the Mafiosi who had been threatening them, yet in a figurative sense made prisoners of the family as well: since then, they have to share their daily lives with armed bodyguards. This brave example quickly set a precedent. More than 100 entrepreneurs from Palermo and its surrounding area followed suit. 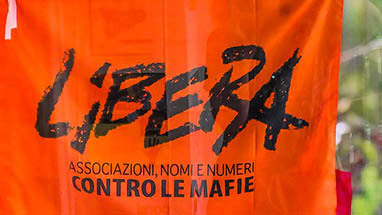 They also established the "Libero Futuro" or Free Future initiative, to give each other mutual support. The main objective of this association was to help other entrepreneurs with special "dropout packages" to release them from their Mafia prisons. How long do you think it takes to get from Catania to Palermo by train? The distance is 300km, so maybe it takes 3 hours? Actually, it takes over 5 hours. If you come from England you may think this sounds impressively fast, but in most countries this level of development is very much behind the curve. No wonder most Sicilians prefer long distance buses. To travel the 200 km from Palermo Central Station to Catania Central Station by coach takes about 2.5 hours, for example. The reason for Trenitalia's slow travel times in Sicily is the lack of double-track railway lines. Many intercity trains in Sicily rely on old lines which cannot accomodate two-way travel. The Mafia cannot be blamed directly for this, of course, but it is still one of many examples of Sicily's general underdevelopment. One of the main reasons for this is the Mafia, and the culture that led to the Mafia in Sicily. A historic example of this is the astonishing fact that in the 19th Century 90% of the global sulfur demand was met by Sicilian production. Britain and France almost came to war in their constant struggle to obtain the precious Sicilian sulphur they needed to fuel their industrial revolutions. The Sicilian sulphur industry went into an irreversible decline when the USA developed a more modern method of washing elemental sulphur out of the soil. Many jobs were lost in the USA because of this, whilst literally all jobs were lost in Sicily. The Sicilians had so much sulphur, they might have survived this technical challenge if they had invested a little in modernising their own sulphur mining techniques. Yet how do you reinvest in your business when the Mafia is extorting every last penny of profit you earn? When it demands so much money that you can only pay your miners enough to keep them alive on the verge of starvation, and they even have to make their children go to work to earn their own food? There is no lack of books on the Sicilian Mafia. Most of them describe the Mafia and its crimes in all their gory details. 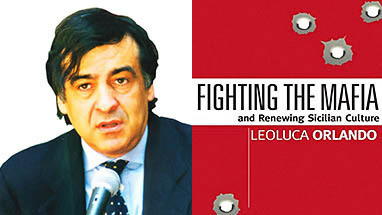 There is also no getting away from this bloodthirsty reality in the book Fighting the Mafia and Renewing Sicilian Culture by Leoluca Orlando which is, essentially, a history of the anti-Mafia struggle in Sicilian society. Leoluca Orlando led this struggle himself as Mayor of Palermo in the 1980s and 1990s. In his book, he describes the reconquest of Palermo, a city he found lost to the Mafia.
" So, at the same time as brave lawmen and prosecutors were dying in order to establish a rule of law, we were trying to rebuild our civic life: repossessing symbols like the Teatro Massimo taking back our politics after a generation of collusion; and perhaps most important, reclaiming our children and their future. Along with our public places, the Mafia had taken over our educational system - not only because it knew that maintaining ignorance among the people was the key to its power, but also because there was money to be made. We stopped renting school space from Mafia front men and women. We began to implement an antimafia curriculum. One of the children's art pieces shown to Hillary Clinton when she toured our city depicted children holding hands around a criminal with a gun, isolated within their circle. We also began to work with the children in the 'Adopt a Monument' program. In the average American or European city, even a run-down one, such an effort would have been simply a modest attempt at social uplift. In Palermo it was a revolutionary break with the past, because the Mafia, like any totalitarian force, gets its power largely by stifling cultural memory and civic identity. " Leoluca Orlando was re-elected Mayor of Palermo in 2012 with over 70% of the vote. Nowadays, however, his task is not so much to fight the power of the Mafia as much as to clear away the legacy of his predecessor, Berlusconi's vassal Diego Cammarata. He had run Palermo down so badly that the daily administration of the city had to be handed over to an emergency provisional government.